As soon as you arrive in Sekiu, Washington, you get a whiff of salty ocean air laced with the unmistakable smell of fresh fish. The scent fills your nostrils as the gulls mew nearby, fighting for the remains of the day’s catch in the protective cove. 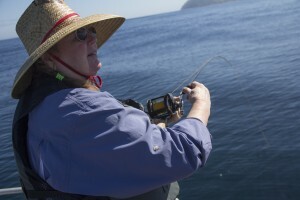 Located 20 miles east of Neah Bay by car, the fishing village has a long reputation for good salmon fishing. It’s also where we pick up the trail of the Lake Washington chinook. 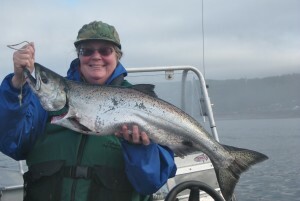 The subset of the Puget Sound salmon were listed as threatened under the Endangered Species Act in 1999 and traced here by scientists who tag them. The fish spend their adult lives in this open ocean before heading home to spawn in the Cedar River or in Bear Creek, or the state hatchery in Issaquah. Pulling into Sekiu, one might expect a bustling fishing village with flotillas of boats hooking plenty of salmon, perhaps because the summer’s headlines have touted a record run of Columbia River chinook. Towns like Westport have been booming with the projected return of 1.5 million chinook, also known as king salmon. Anglers at Buoy 10 on the river this year reportedly spent more time looking for a place to set up their gear than they did reaching daily limits, thanks to successful management of the dams, hatcheries and habitat down south. Also often mentioned in the reports are favorable ocean conditions that have allowed more adult fish from the Columbia River system to survive. But those ocean conditions aren’t doing much for the fishing in Sekiu. “It’s surprisingly quiet. 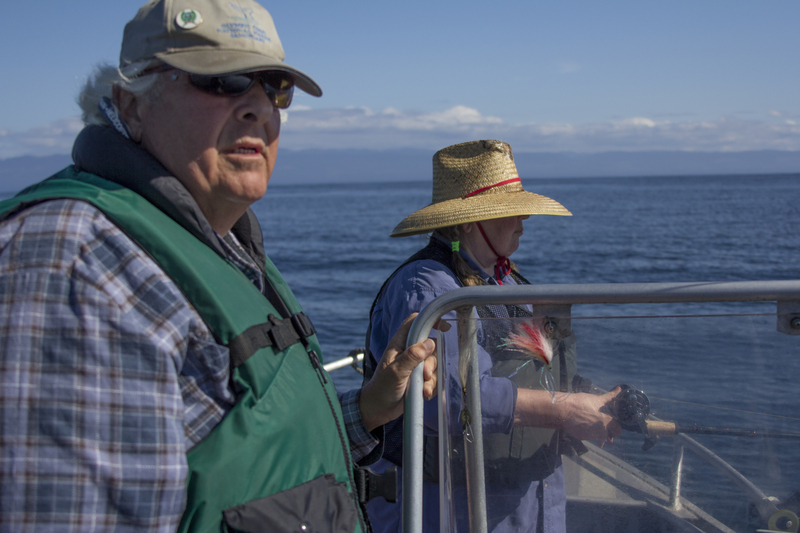 Usually one of the peak times of the year is right now,” says veteran guide, Roy Morris, a life-long salmon fisherman who has kept a charter boat at the docks in Sekiu for 20 years. One reason, he suspects, is unusually warm water, which he says it’s been about 5 degrees hotter than normal. The warm water off the Northwest coast, which is linked to one of the hottest summers the region has ever seen, is what’s believed to have caused a record number of sockeye to bypass Sekiu and many other ports in Washington in favor of cooler waters in Canada. Morris says it probably hasn’t helped the chinook here, either. “It is surprising, because I know there’s many people working together to try to improve conditions and survival for salmon, but it’s up and down from year to year within a decade, [and] this year is some of the lowest catches for Puget Sound chinook that we’ve ever witnessed,” he says. 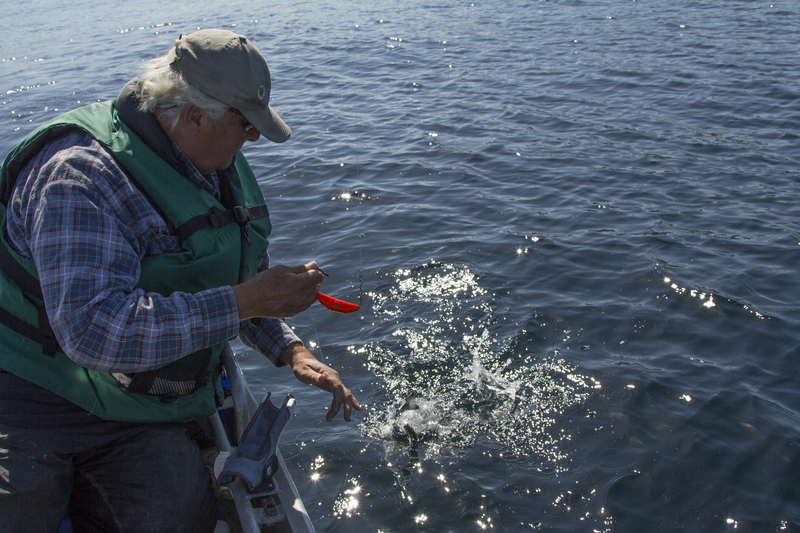 Ocean conditions are a bit of a black box for scientists; they know that huge percentages of the young salmon that leave fresh water never return as adults, but information about why is scarce. The recent launch of an international research effort, the Salish Sea Marine Survival Project, seeks to fill the information gap. But for Morris, it’s just one of many causes. For another, he cites the influence of hatchery fish that are released in droves and feed on limited food sources “like a herd of sheep” while wild fish trickle out gradually. But he links most of the fish’s decline to urbanization and development that destroys fish habitat. 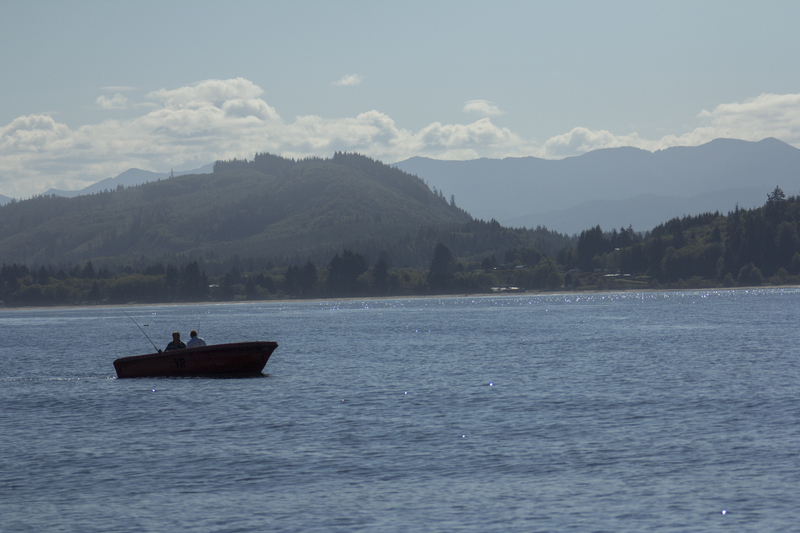 He remembers the days of his youth in the 1950s and ‘60s when salmon fishing was such a popular family vacation that you could hardly find a place to park your boat in places like Ilwaco. Chinook hold a special status in the world of sport fishing. “[It’s] called the king because it’s the biggest and the most spectacular,” Morris says, noting that sometime his guests get frightened by how long and hard they’ll pull on a line. Morris calls them “the long distance runners.” He notes that Columbia River chinook traverse nearly the entire state and reach Canada before coming back home. And his favorites, the Puget Sound chinook, even climb mountains. And they get harder to catch at this time of year, when their bodies start changing with physiology that signals it’s time for them to head to home waters and spawn. They lose interest in food, presenting extra challenges for anglers who use special lures and techniques to hook them. Morris is not just a seasoned salmon fisherman; he’s exceptionally passionate about saving the fish. He says he caught his first salmon when he was 5, helped his grandson catch one at age 4 and wants that lineage to continue. But does he ever think it would be better to stop hunting an endangered species?Yes, he says, but as long as the fishing is allowed, he wants to be part of it. By being out on the water 100 days a year and also volunteering on boards as a representative of sport fishermen, he feels his perspective is an important contribution to augment data sets collected by government agencies. And he sees part of his role as educating the public about endangered fish and the issues they face. “The chinook is one of the more fragile of the spectrum of salmon in the Northwest,” he says. He remembers when they were first listed 15 years ago and the fishery was closed. He thought it might never reopen, that their declines had gone too far. “But where barriers are removed, they’re amazing the way that they’ll try to fight for their survival if they’re given half a chance,” he says. One only needs to look to Issaquah Creek and its Salmon Days festival for evidence, he says. In places where habitat has been restored and fish protected with policies, the fish do come back. And he sees another ray of hope in the recent return of chinook to the Elwha River, where the nation’s largest dam removal has just been completed. TAHOLAH — About two months ago, Marco Black heard the Pacific Ocean knocking at his back door. The Taholah native was experiencing a severe storm at his waterfront home. One wave broke the seawall separating the town from the ocean, forcing the barrier to collapse and knocking his smokehouse off its foundation. More urgent than Black’s smokehouse are all the homes within Taholah. The town sits in a tsunami zone, and parts of the main community flood three-to-four times a year. Since the storm, the Army Corps of Engineers has repaired the 36-year-old wall, but called it “a band-aid”, and not a permanent solution. In search of something long-term, the tribe is pushing for a new tactic, one that has been talked about for decades but may finally happen. Moving the town to higher ground. Ralston said land has already been chosen for a new town, and a three-year study to find ways to make the move happen is currently underway. The main issue is tsunami danger, but the rising tide of the Pacific Ocean is also a major concern. The main part of Taholah includes around 1,700 residents, the school, police and fire departments, the mercantile, the post office and a retirement home. It’s also the location of many of the most important pieces of the Quinault Tribe’s ancestry. Black, whose family has lived near the ocean for decades, admits he’ll lose his land to the ocean one day. It’s a realization made reluctantly, but with the knowledge there are few other choices. It is unclear how much it will cost to move Taholah. Action by the tribe and federal agencies could be years away, Ralston said. Sharp, who is also President of the Affiliated Tribes of Northwest Indians, encompassing six Northwest states, and Area Vice President of the National Congress of American Indians, is the only tribal member of the Governor’s task force. “Whether it’s the warming of the Pacific Ocean, Hurricane Sandy, the tornadoes across the country or the Oso landslide, the melting of our Mt. Anderson Glacier or the breaching of our Taholah seawall, the link to climate change is clear to us. It has been for a long time. And so is the absolute need to take action,” said Sharp. “It’s a primary reason why I have agreed to work with the Governor on his Carbon Emissions Reduction Task Force. It’s a key reason why we have taken a strong stand against the proposal to build oil terminals in Grays Harbor and substantially increase the number and frequency of oil trains and tankers. It’s why we are reaching out to strengthen alliances with neighboring communities and entities of all kinds and it’s why we have been so heavily engaged in the effort to resolve the climate change challenge for many years — through political, education and habitat-related programs. “Quinault is a nation of people who, like their ancestors for thousands of years, fish, hunt and gather. The core of our economy is based on health and sustainable natural resources—a clean and vibrant ecosystem. We are also a nation blessed with thousands of acres of forest land. We do not manage our forests to the detriment of our fishing and hunting, but the other way around. Managing holistically, with respect for our descendants, and their needs is the key. These are the lessons of our ancestors, lessons that oil tycoons and timber barons never learned to appreciate. We are a people who are determined to practice good stewardship. Sometimes that means doing habitat work in the Quinault River, something we have done extensively for many years. Sometimes it means taking part in international climate change summits—providing a leadership role in such efforts as the United Nations’ Conference of Parties (COP 14) in Poznan, Poland in 2009 or the First Stewards Summit in Washington D.C.,” said Sharp. 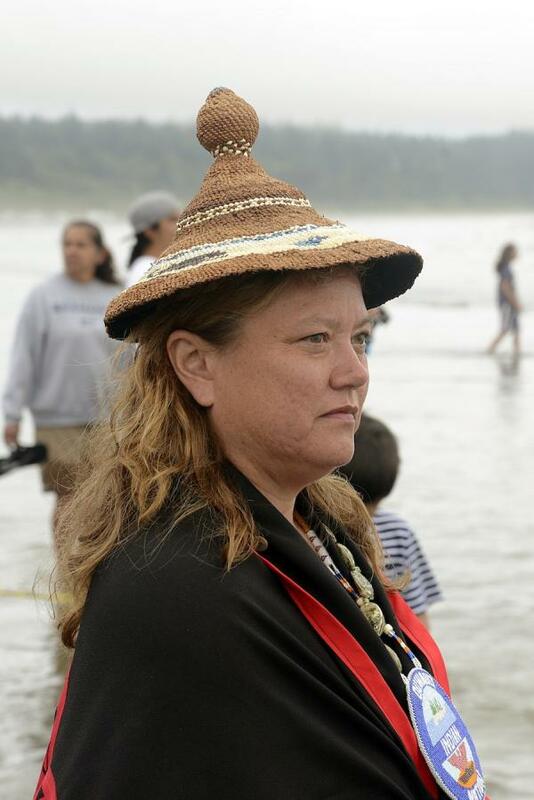 Quinault Nation established a comprehensive set of climate change policies in 2009, before Congress considered introducing its national policies. We have advocated and advanced our climate change-related interests locally, regionally, nationally and internationally. “We have asked the President and Congress to understand the connection between climate change and such impacts as the decline of our Blueback salmon run and the destruction that is now occurring with shellfish and other species in the ocean due to acidification and hypoxia. Other tribes have worked alongside us, pushing for action by the State of Washington, the United States and the United Nations, for many years. It is our heritage, and right, to do so,” said Sharp. “We believe it’s time to call to end the nonsensical debate in the Legislature and in Congress about whether it exists. It does, and it is very serious. “Year in and year out we are all facing the deadly consequences of a century of environmental contempt, and ignoring that fact will not make the challenge go away. 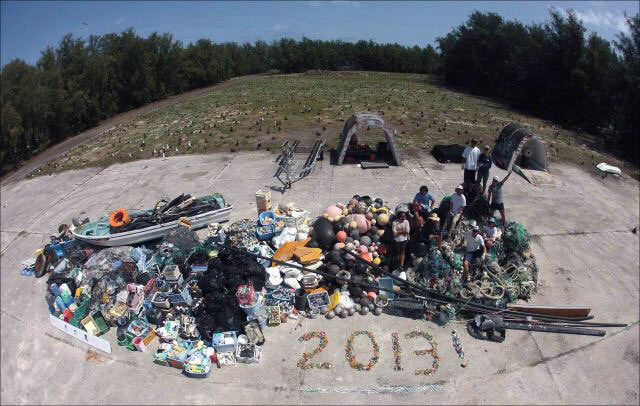 It is time for people to treat our natural environment with the respect it deserves,” she said. An overdose of carbon in the atmosphere subsequently causes too much acidity in the world’s oceans, Chris Harley, a marine ecologist from the University of British Columbia, told CTV News. Overly acidic water is bad for shellfish, as it impairs them from developing rigid shells. Oyster hatcheries along the West Coast are also experiencing a steep decline,CTV News reports. “The current rate of change is likely to be more than 10 times faster than it has been in any of the evolutionary crises in the earth’s history,” said German marine biologist Hans Poertnerupon the release of a recent study published in the journal Nature. Ocean acidification has been referred to as the “evil twin” of climate change. Poertner says that if humanity’s industrial carbon emissions continue with a “business as usual” attitude, levels of acidity in the world’s oceans will be catastrophic. SEATTLE — The Navy is pursuing permits to continue conducting sonar and explosives exercises in a large area of the Pacific Ocean — and that’s putting marine mammal advocates on high alert. Public hearings kick off next week as the Navy gathers public comments on its draft environmental impact statement for the Northwest training and testing range. The range stretches from northern California to the Canadian border. Marine mammals, like porpoises, gray and fin whales and endangered orcas, travel through the Navy’s training range. 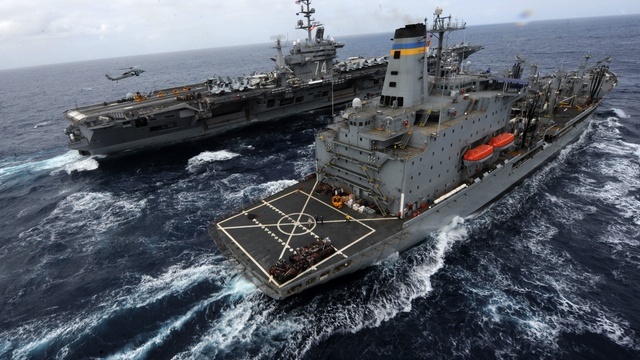 That’s why marine mammal advocates are voicing concerns about the Navy’s activities. In the draft EIS the Navy outlined plans to conduct up to 100 mid-range active sonar tests each year. That type of sonar has been shown to affect marine mammal behavior. The Navy also wants to conduct up to 30 bombing exercises per year in the range. John Mosher, Northwest Environmental program manager for the U.S. Pacific Fleet, says the training range is critical to naval preparedness. “At some point realistic training, whether it’s with explosives or sonar, has to take place and they truly are skills that are perishable, things that have to be routinely conducted to be able to do them in case the real need occurs,” Mosher said. The Navy gathered more than 300 public comments during an earlier scoping phase of its environmental review. Most of those comments centered around impacts on marine mammals. The Navy has plans in place to look and listen for marine mammals before and during testing exercises. But environmentalists say the mitigation measures are inadequate. The National Oceanic and Atmospheric Administration has been studying the endangered orca population of Puget Sound by tagging orcas and using underwater acoustic monitoring devices to better understand how the whales move through the region. The population of Southern Resident Orcas is hovering around 80 individuals, and has been decreasing in recent years. 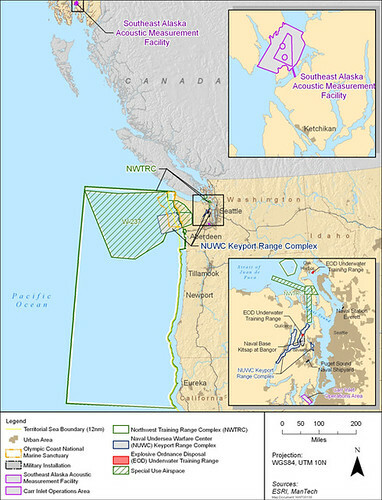 Brad Hanson, an expert on orcas with NOAA, says the area within the naval training and testing range is an important forage area for the whales. “We want to figure out if there are particular areas that the whales are using so the Navy could avoid using those areas for training exercises that might cause any type of harassment of the animals,” he said. 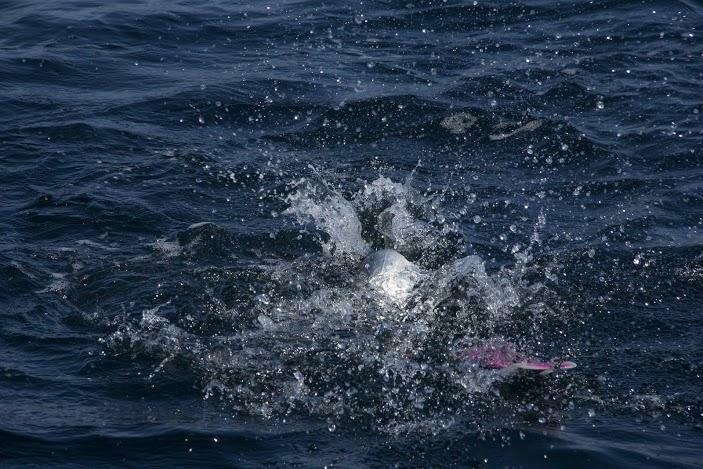 Hanson’s tagging research has shown orcas moving from Washington to northern California within the span of a week. The body of 3-year-old female Orca L112. Last year a 3-year-old female orca washed up dead near the mouth of the Columbia River. Her body showed signs of trauma that could have been the result of an explosion but it had been drifting on the Columbia River’s eddies for days, making the results of the necropsy report inconclusive. 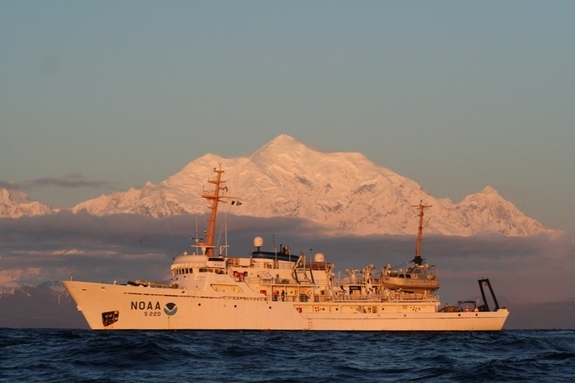 The official findings were to be released by NOAA Fisheries on Monday. “It’s probably the most comprehensive necropsy report I’ve ever seen done on a killer whale,” Hanson said. The Navy also recently announced plans to build a new $15 million dollar facility near Port Angeles, Wash. on the Strait of Juan de Fuca. Feb. 26, 5-8 pm: Oak Harbor High School, Oak Harbor, Wash.
Feb. 27, Cascade High School, Everett, Wash.
Feb. 28, North Kitsap High School, Poulsbo, Wash.
March 3, Astoria High School, Astoria, Ore.
March 4, Isaac Newton Magnet School, Newport, Ore. The deadline for written comments on the Northwest Training and Testing range EIS is March 25. YOTSUKURA, Japan (AP) — Third-generation fisherman Fumio Suzuki sets out into the Pacific Ocean every seven weeks. Not to catch fish to sell, but to catch fish that can be tested for radiation. For the last 2 ½ years, fishermen from the port of Yotsukura near the stricken Fukushima Dai-Ichi nuclear plant have been mostly stuck on land with little to do. There is no commercial fishing along most of the Fukushima coast. In a nation highly sensitive to food safety, there is no market for the fish caught near the stricken plant because the meltdowns it suffered contaminated the ocean water and marine life with radiation. A sliver of hope emerged after recent sampling results showed a decline in radioactivity in some fish species. But a new crisis spawned by fresh leaks of radioactive water from the Fukushima plant last week may have dashed those prospects. Fishermen like 47-year-old Suzuki now wonder whether they ever will be able to resume fishing, a mainstay for many small rural communities like Yotsukura, 45 kilometers (30 miles) south of the Fukushima plant. His son has already moved on, looking for work in construction. “The operators (of the plant) are reacting too late every time in whatever they do,” said Suzuki, who works with his 79-year-old father Choji after inheriting the family business from him. “We say, ‘Don’t spill contaminated water,’ and they spilled contaminated water. 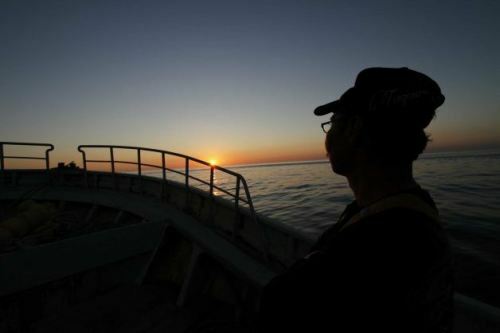 They are always a step behind so that is why we can’t trust them,” Suzuki said, as his trawler, the Ebisu Maru, traveled before dawn to a point about 45 kilometers (30 miles) offshore from the Fukushima plant to bring back a test catch. With his father at the wheel, Suzuki dropped the heavy nets out the back of the boat, as the black of night faded to a sapphire sky, tinged orange at the horizon. As the sun rose over a glassy sea, father and son hauled in the heavily laden nets and then set to the hard work of sorting the fish: sardines, starfish, sole, sea bream, sand sharks, tossing them into yellow and blue plastic baskets as sea gulls screamed and swooped overhead. Five hours later, the Ebisu Maru docked at Yotsukura where waiting fishermen dumped the samples into coolers and rushed them to a nearby laboratory to be gutted and tested. Suzuki says his fisheries co-operative will decide sometime soon whether to persist in gathering samples. For now they will have to survive on compensation from the government and Tokyo Electric Power Co., the plant’s operator. The cooperative also had plans to start larger-scale test catches next month that would potentially also be for consumption if radiation levels were deemed safe. But those plans were put on hold after more bad news last week: authorities discovered that a massive amount of partially treated, radioactive water was leaking from tanks at Fukushima, the fifth and so far the worst, breach. The water, stored in 1,000 tanks, is pumped into three damaged reactors to keep their melted fuel cool. Much of the water leaked into the ground but some may have escaped into the sea through a rain-water gutter. On Wednesday, the Nuclear Regulation Authority upgraded its rating of the leak to a “serious incident,” or level 3, up from a level 1 on the international scale of the International Atomic Energy Agency. 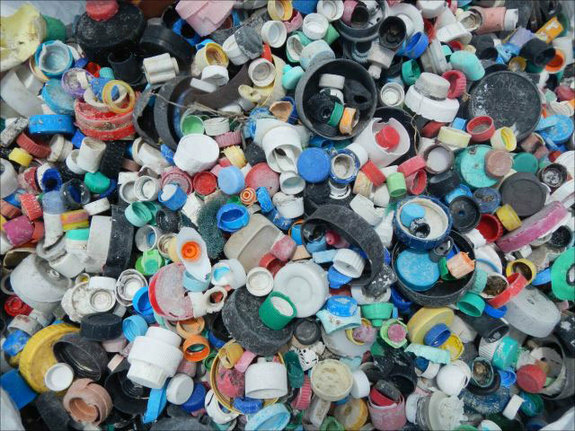 It remains unclear what the environmental impact from the latest contamination will be on sea life. Scientists have said contamination tends to be carried by a southward current and largely diluted as it spreads. Nobuyuki Hatta, director of the Fukushima Prefecture Fisheries Research Center, said the trend had been positive before the latest leaks, with fewer fish found exceeding radiation limits. The government’s safety limit is 100 becquerels per kilogram, but local officials have set a stricter bar of 50 becquerels, said Hatta, who still expects test fishing to resume in September. It all depends on the type of fish, their habitat and what they eat. Out of 170 types of fish tested, 42 fish species are off limits due to concern they are too radioactive, another 15 species show little or no signs of contamination. Few, if any, show any detectable levels of cesium. Tests take over a month and are complicated. The time lag makes it difficult to say at any given point if sea life caught off the Fukushima coast is really safe to eat. Also, local labs lack the ability to test fish for other toxic elements such as strontium and tritium. Scientists say strontium should be particularly watched for, as it accumulates in bones. TEPCO’s monitoring results of sea water show spikes in strontium levels in recent weeks. Suzuki has little faith in the future of his business. Associated Press writers Elaine Kurtenbach and Mari Yamaguchi in Tokyo contributed to this report. 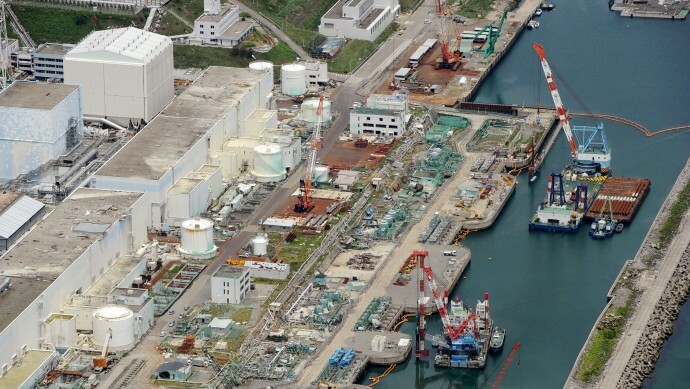 The operator of the crippled Fukushima Daiichi nuclear power plant, Tokyo Electric Power Company (TEPCO), on Monday admitted that radioactive groundwater had leaked out to Pacific Ocean, fueling fears of contamination. Earlier this month TEPCO said groundwater samples taken at the Fukushima showed levels of possibly cancer-causing caesium-134 had shot up more than 110 times in a few days, Australia’s ABC reported. In July, Russia Today reported, Japan’s nuclear watchdog — the Nuclear Regulation Authority (NRA) — stated that it ”strongly suspected” contamination of ground waters and possibly the Pacific Ocean. TEPCO did not know the exact reasons for the increased readings, but initially said the radioactive groundwater was likely contained by concrete foundations and steel sheets. The March 2011 earthquake and tsunami off Japan’s coast knocked out cooling systems at the Fukushima plant, triggering fuel meltdowns and causing radiation leakage, food contamination and mass evacuations. Radioactive substances have since made their way into underground water, which usually flows out to sea.